I was forced to put off my review of the Fuhu Nabi BigTab HD 24 by three days because I had taken away my son’s gaming privileges. And yes, that’s an odd way to begin telling you about a very good educational tablet geared for kids. But raising a child involves more than throwing new technology at them; it’s exposing them to what’s appropriate, and limiting that exposure. Some may see the BigTab as just a massive Android tablet. But it’s actually a bundle of fun, educational software controlled by management tools that allow you to place limits on your child’s digital playtime. 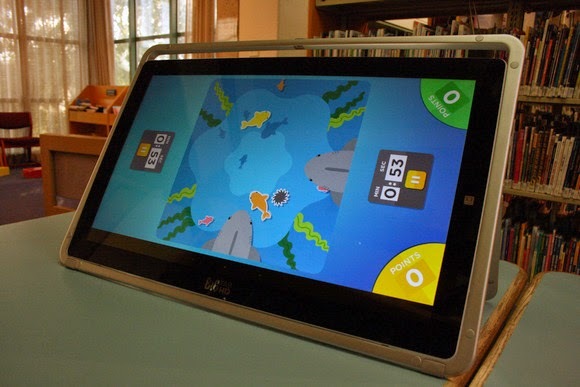 The BigTab HD 24 elicited an awed “Whoa” from my six-year-old son, who quickly volunteered to help “test” it. We both came away impressed: he with the variety of apps, including the ability for me to load his favorites on the tablet, and me with the ability to create a virtual playspace to keep him entertained. We both agreed, though, that the BigTab probably favors boys over girls, however, and that we didn’t think the BigTab was appropriate for his two-year-old brother, because of the size. At $549, the BigTab HD 24 is priced slightly more than an entry-level Apple iPad Air 2 (the 16GB model costs $499), which would be more the little one’s speed. 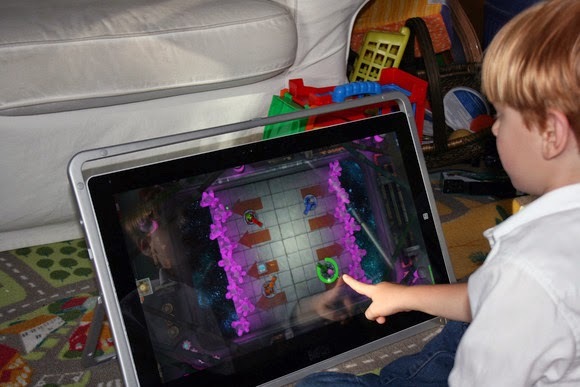 The BigTab has games that appeal to the very young, but the sweet spot appears to be about five years of age or so. 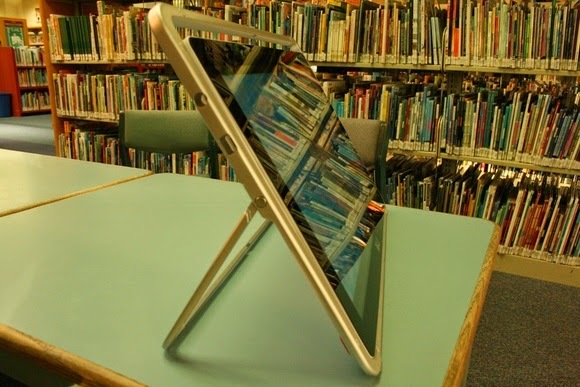 Physically, the BigTab is solidly built—I don’t want to say “kid-proof,” but a lot of care has obviously gone into the construction. I measured the BigTab HD 24 at 22.5 inches of screen size, with a full 1920x1080-pixel display. 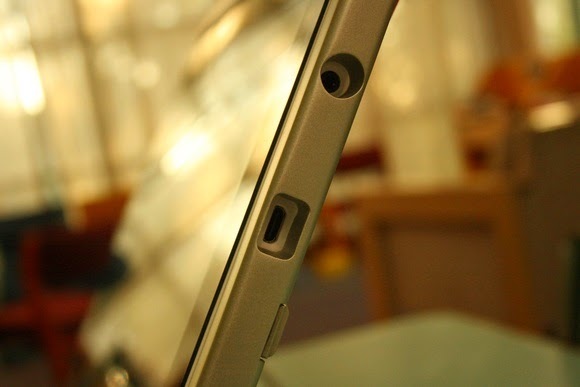 Surrounding it is a 24.5-inch rugged removable metal frame that locks into the tablet itself, providing a kickstand. On top, it sticks up from the tablet about two inches, providing a sturdy carrying handle as I moved it from room to room. The kickstand seems unusually sturdy, but it's not foolproof. You don’t have to tote the power cord everywhere, but the BigTab HD 24's battery won’t last you more than about 90 minutes, thanks to that massive screen. Note that there is a “performance” slider buried within the generic Android settings to dial down the performance of the embedded Nvidia Tegra 4 processor and extend the battery life somewhat. An unexpected glitch that happened once: When inserting the power cord into the partially charged tablet, it shut itself off. The USB ports are drilled through the frame, so only narrowly cut USB keys will fit. I would be a little worried about what would happen if this huge tablet fell over near a small child. The Big Tab HD 24 weighs an estimated 13.5 pounds. I foolishly placed it on our coffee table, kickstand extended, and left the room for a few minutes—only to be informed sadly by my son that it had fallen off. I’m still not sure what happened. The good news is that the BigTab survived the 18-inch fall to a hardwood floor without incident, and my youngest was nowhere nearby it when it did. When you power on the BigTab HD 24, the first thing you’ll see is a cartoon picture of your child, together with a recorded message that he or she can choose to play. Sliding right reveals several pages of apps and interactive books. At the bottom of the screen is the familiar Android “home” and “back” buttons for navigation. In the upper right there’s also an Android-y “more apps” button that pulls you out of the BigTab UI and into an Android interface. When your child turns on the BigTab, he or she is greeted with a picture as well as an optional message you can record. 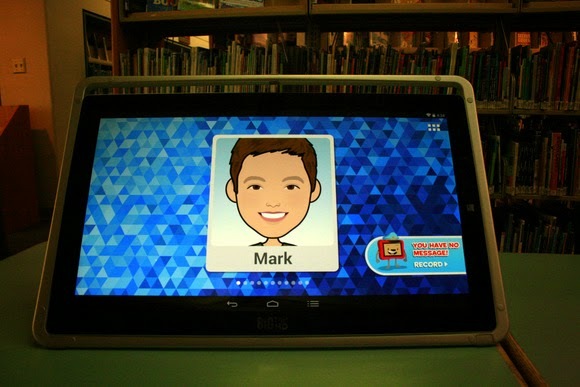 The BigTab begins with a picture of your child, plus an optional message that you can record. Slide right, and you can begin exploring: first through some of Nabi’s own apps, including generic games like checkers and backgammon. (Several of these lack a single-player mode, encouraging you to play with your child.) Younger kids should enjoy a version of Hungry Hungry Hippos, but played with hungry sharks instead. The tablet’s drawing app is excellent, with large, well-organized drawing tools and stickers that show off the large screen to its best advantage. Further on, the games become more commercial, like Fruit Ninja. My son’s favorite was Epic Stickman, which asks your child to draw a stickman, animates it, and then challenges your child to use it to rescue a fellow stickman by moving through drawing-based challenges. But I was disappointed by the iStoryTime and Speakaboos interactive storybook apps, as they’re mainly pitches for you to buy third-party video. There are also utilities like Nabi Konnect, which allow you to chat and share photos with friends that parents pick, and carefully guided tours of the Web (which equate to little more than toy and movie sites). Videos and music channels are also included. Although the games on the BigTab are generally pretty harmless, some, like "Don't Fall in the Hole," do incorporate some more mature themes, like guns. Not everything’s perfect: A Bag It! game invited kids to shake the tablet to settle virtual groceries—a game mechanic that could actually be dangerous with a tablet of that size. And another, Gear Jack, used virtual buttons on either side of the screen that needed to be quickly pressed, awkward for kids to stretch that far. An air hockey simulator worked best when then screen was flat, but others wanted the tablet to be rotated to portrait mode, which really isn’t possible. Although my son would happily spend hours playing video games, that’s not going to fly. Fortunately, I was able to limit his play time via a “mommy mode “ or “daddy mode” that allowed me to set daily time limits, such as 45 minutes per day. You can also set a chore list and even reward your child for completing it. (When the limit is exceeded, the tablet throws up a “Nap Time!” screen and refuses to do anything else until “Daddy mode” is activated.) There's a related Android app that allows you to log in, monitor the tablet use, and adjust the settings remotely. Finally, the "Nabu Security Agency" stores all of your child's email, chats, and photos for you to review. In all, it’s really an excellent solution for keeping tabs on your child’s tablet use. The BigTab's parent mode allows you to manage your children's BigTab use. I was less enamored with Fuhu’s virtual currency, Nabi Coins, which allows you to reward your kids by buying them movies or apps. As a rule, my son wants to play whatever his friends are playing, and there’s a constant battle to rein that in. I couldn’t see myself ever using that, personally. 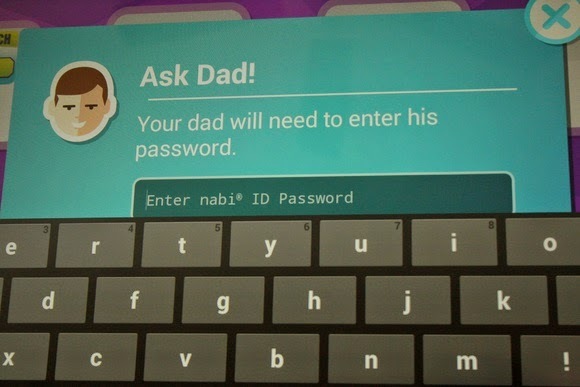 If your child wants to play longer, he or she will need the password. 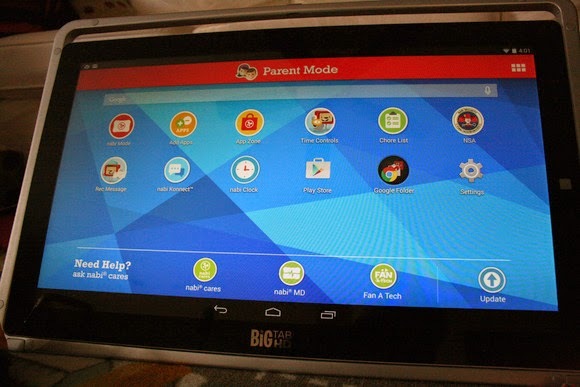 Behind the scenes, the BigTab is an ordinary Android tablet, with apps like Gmail accessible via the parental menu, And if your child does have a favorite game that Fuhu hasn’t included—Angry Birds, for example—you can download the game via the Google Play store. But since you can’t add those games to the main menu screens, you’re awkwardly forced to leave the Fuhu interface and hunt it down via the “All apps” button in the upper right. Every day I’ve had the Fuhu Nabi BigTab HD 24 on loan, my son has asked to play it. And yes, I’ve consistently used the management features to remind him that it’s time to shift something else. Technology, including computers, will be a part of his life, and the Nabi BigTab HD 24 is a pretty good way to let him start exploring.